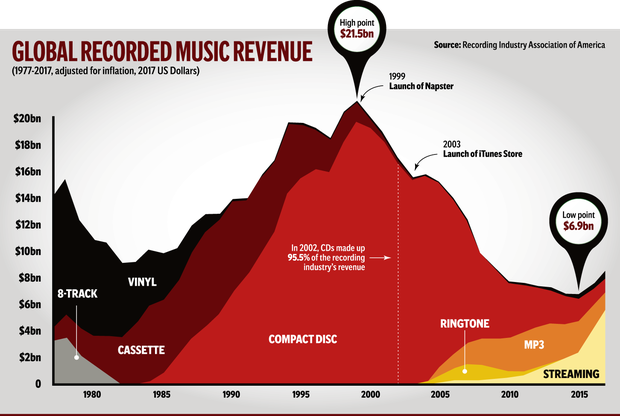 While it has not replaced the money machine that compact discs represented, for the first time this decade the industry in the United States posted an increase in income for two consecutive years (2016 and 2017), and likely a third in 2018. This is according to a paper from the World Economic Forum (WEF). In Ireland, the Irish Music Rights Organisation (IMRO) is responsible for the protection, promotion and development of the collection and distribution of music royalties. Music-users such as broadcasters, venues and businesses must pay for their use of copyright music by way of a blanket licence fee to the organisation. A 2017 report from the IMRO found that digital revenues in Ireland (€16.3m) surpassed physical revenues (€16m) for the first time. Growth in streaming revenues was particularly pronounced and overtook downloads for the first time. Overall the music industry contributed just over €700m to the economy in Ireland in 2017. The music industry is understood to support 13,000 jobs. In order to further the sector in Ireland, the body has set out a number of recommendations to maximise the contribution of music here, including the development of a National Music Strategy. The increase in revenue from streaming will be of some comfort to an industry that has for a number of years been suffering from piracy. Most younger music fans have never purchased products such as CDs or records. Founded in 1999, Napster, the first widely used peer-to-peer service, figuratively skipped the needle off the record and ended what had been years of vast profitability in the recording industry, according to the WEF. Napster was shut down in 2002, but piracy’s impact on the music industry was immediate and stark. Music sales, which had been experiencing impressive year-over-year growth, began a decline that would continue for 15 years. It took a while for consumers to warm up to paying for a premium music subscription, but today, there’s a basis for optimism. Music streaming is now the most common format for music in the US, and the Recording Industry Association of America reports that streaming now takes up nearly half of the market. And while CD sales are almost a thing of the past, down 80pc in the past 10 years, vinyl is providing the sector with a more uplifting note. In 2017, vinyl sales in the US hit 25-year high after making a slow and steady comeback. While music revenues may never return to their peak of $21bn in the noughties, not stopping thinking about tomorrow may be about to become easier for the industry.